Facebook verzeichnete in Q1/2013 1.110 Mrd. Nutzer (Q4/2012 = 1.056 Mrd. ), 195 Mio. in USA und Kanada (Q4/2012 = 193 Mio. ), 269 Mio. in Europa (Q4/2012 = 261 Mio. ), 319 Mio. in Asien (Q4/2012 = 298 Mio. ), 327 Mio. in den restlichen Regionen (Q4/2012 = 304 Mio.). Der Zuwachs gegenüber Q1/2012 zu Q1/2013 beträgt 23.19%. Der Zuwachs von Q4/2012 zu Q1/2013 rund 5.11%. 665 Millionen Nutzer sind täglich auf Facebook aktiv (60%). 179 Millionen in Europa (67% der Nutzer in Europa), 167 Millionen in Asien (52% der Nutzer in Asien), 139 Millionen in USA und Kanada (71% der Nutzer in USA und Kanada) und 180 Millionen in den restlichen Regionen (55% aller Nutzer der übrigen Regionen). Die Zahl der täglich aktiven Nutzer hat in allen Gebieten zugelegt. 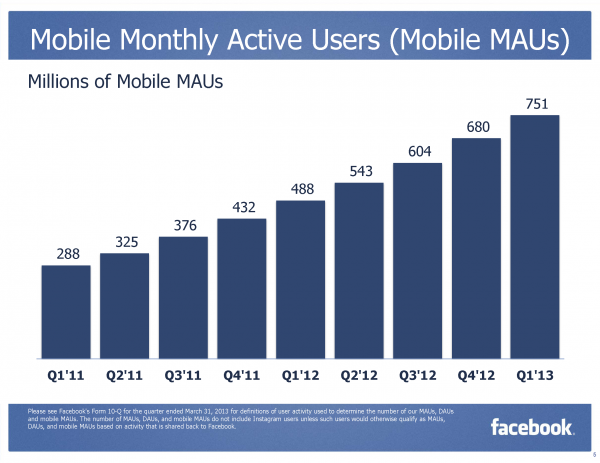 Facebook verzeichnet 751 Millionen monatlich aktive Mobile Nutzer (Q4/2012 = 680 Mio. ), was einem Anteil von 67.7% entspricht (Q4=2012 = 64.4). Der Anteil der monatlich aktiven Mobile Nutzer ist gegenüber Q4/2012 in Q1/2013 überproportional angestiegen. Während die Summe der Nutzer in dieser Zeitperiode nur um 5.11% angestiegen ist, wuchs der Anteil der Mobile Nutzer in der gleichen Zeit um 10.44%. 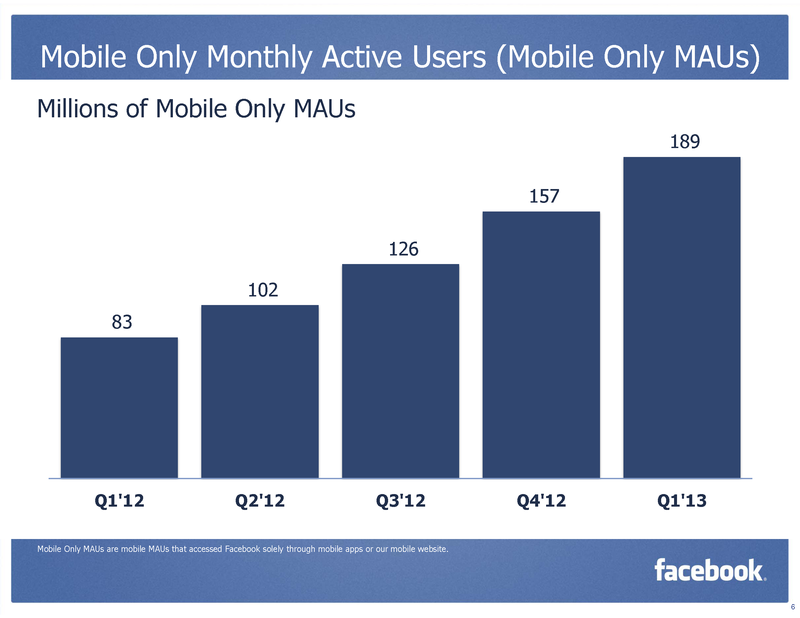 Facebook weist per Q1/2013 189 Millionen monatlich monatlich aktive nur Mobile Nutzer aus (Q4/2012 157 Millionen). 17.00% aller Facebook Nutzer nutzen Facebook nur auf einem Mobile-Gerät, was einem Wachstum von 20% von Q4/2012 zu Q1/2013 darstellt. Facebook erzielte in Q1/2013 1.458 Mrd. $ Umsatz, was einer Steigerung von 37.80% gegenüber Q1/2012 entspricht, bzw. einem Rückgang von 8.02% gegenüber Q4/2012. 679 Mio. der 1.458 Mrd. $ Umsatz wurden in Q1/2013 in USA & Kanada erwirtschaftet (46.6%), 29.0% oder 423 Mio. in Europa, 197 Mio. in Asien (13.5%) und 159 Mio. (10.9%) in den übrigen Regionen. 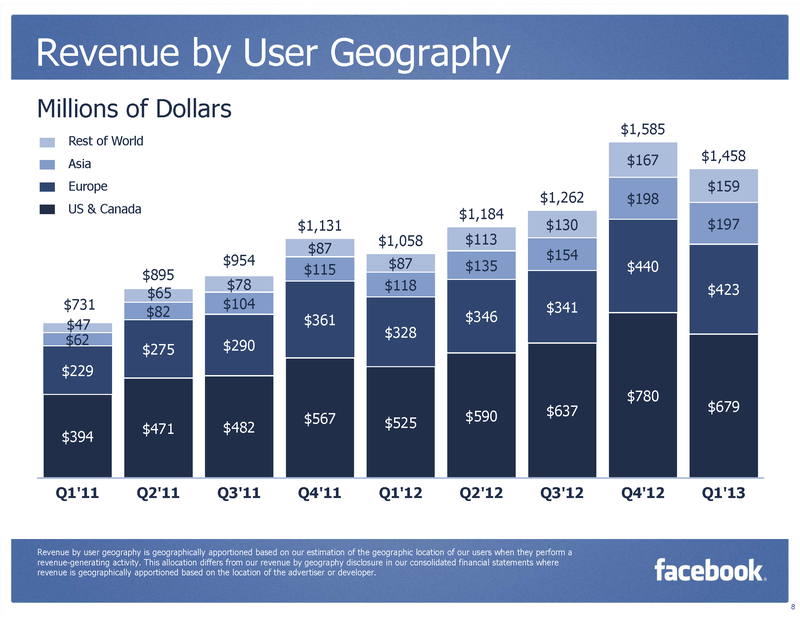 Facebook erzielte in Q1/2013 1.245 Mrd. $ Werbeumsatz, davon 552 Mio. $ (44.3%) in den USA und Kanada, 367 Mio. $ (29.5%) in Europa, 176 Mio. $ (14.1%) in Asien und 150 Mio. $ (12.0%) in den übrigen Regionen. Durchschnittlich macht Facebook in Q1/2013 1.35$ Umsatz pro Benutzer, in den USA & Canada sind es 3.50$ pro Benutzer, in Europa 1.60$, in Asien 0.64$ in Asien und nur gerade 0.50$ in den übrigen Regionen. 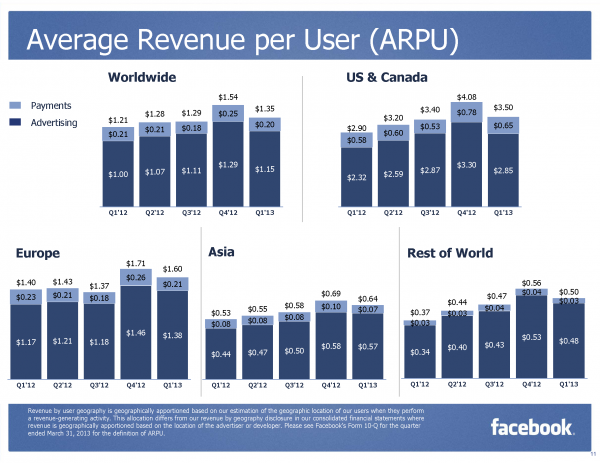 Facebook macht also somit mit einem Nutzer in den USA und Canada den 2.188fachen Umsatz als mit einem Nutzer aus Europa. 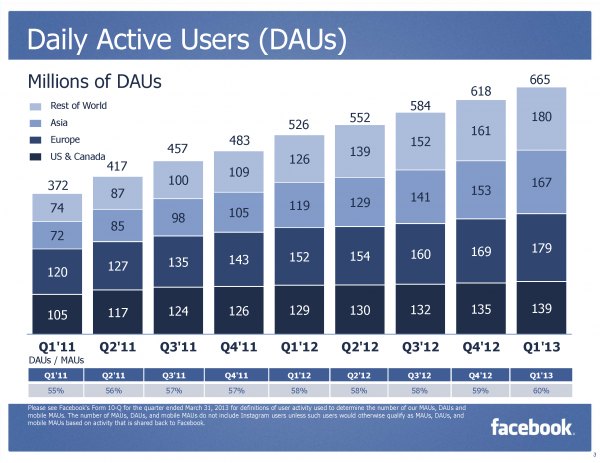 Daily active users (DAUs) were 665 million on average for March 2013, an increase of 26% year-over-year. 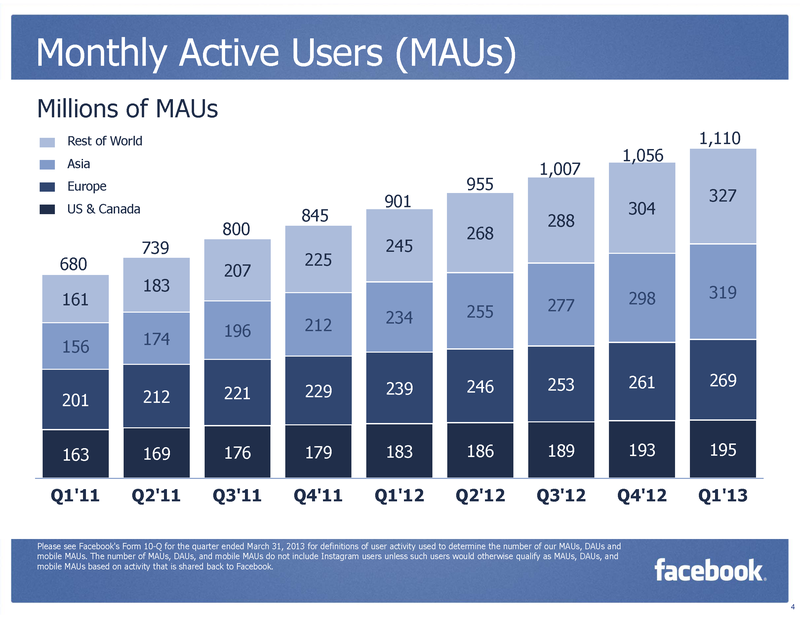 Monthly active users (MAUs) were 1.11 billion as of March 31, 2013, an increase of 23% year-over-year. Mobile MAUs were 751 million as of March 31, 2013, an increase of 54% year-over-year. Launched Facebook Home, a mobile experience for Android that puts people before apps and makes the phone a more social experience. Instagram reached 100 million monthly active users in the first quarter of 2013. Launched new advertising products such as Lookalike Audiences, Managed Custom Audiences, and Partner Categories, which help marketers improve their targeting capabilities on Facebook. 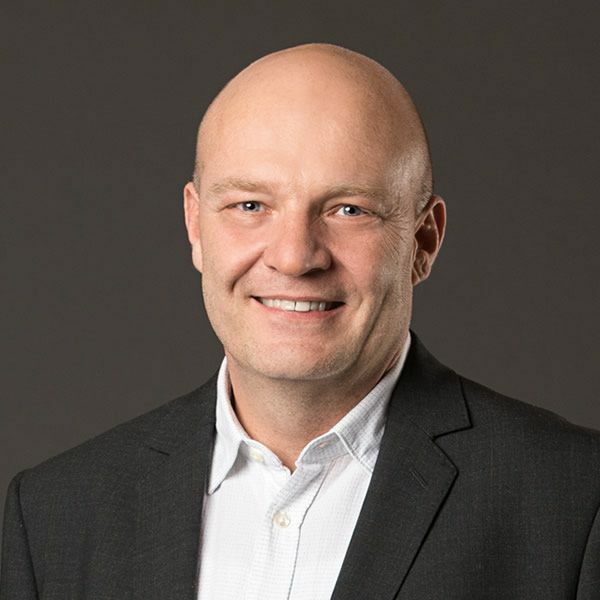 Partnered with Datalogix, Epsilon, Acxiom, and BlueKai to enable marketers to incorporate off-Facebook purchasing data in order to deliver more relevant ads to users. Enhanced ability to measure advertiser ROI on digital media across the internet through our acquisition of the Atlas Advertising Suite. Appointed Susan D. Desmond-Hellmann, M.D., M.P.H., chancellor of the University of California, San Francisco (UCSF), to the company’s board of directors. Revenue — Revenue for the first quarter totaled $1.46 billion, an increase of 38%, compared with $1.06 billion in the first quarter of 2012. Revenue from advertising was $1.25 billion, representing 85% of total revenue and a 43% increase from the same quarter last year. 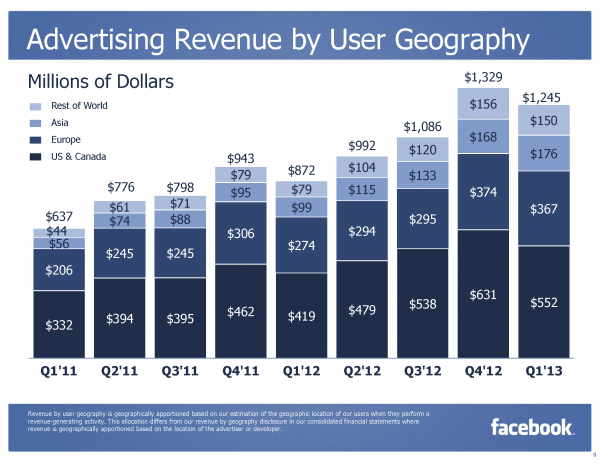 Mobile advertising revenue represented approximately 30% of advertising revenue for the first quarter of 2013. Payments and other fees revenue was $213 million for the first quarter of 2013. Costs and expenses — First quarter GAAP costs and expenses were $1.08 billion, an increase of 60% from the first quarter of 2012, driven primarily by infrastructure expense and increased headcount. Non-GAAP costs and expenses were $895 million in the first quarter, up 56% compared to $573 million for the first quarter of 2012. Income from operations — For the first quarter, GAAP income from operations was $373 million, down 2% from $381 million in the first quarter of 2012. Excluding share-based compensation and related payroll tax expenses, non-GAAP income from operations for the first quarter was $563 million, up 16% compared to $485 million for the first quarter of 2012. Operating margin — GAAP operating margin was 26% for the first quarter of 2013, compared to 36% in the first quarter of 2012. Excluding share-based compensation and related payroll tax expenses, non-GAAP operating margin was 39% for the first quarter of 2013, compared to 46% for the first quarter of 2012. Provision for income taxes — GAAP income tax expense for the first quarter of 2013 was $134 million, representing a 38% effective tax rate. Excluding share-based compensation expense and related payroll tax expenses, the non-GAAP effective tax rate would have been approximately 43%. Net income and EPS — For the first quarter, GAAP net income was $219 million, up 7% compared to net income of $205 million for the first quarter of 2012. Excluding share-based compensation and related payroll tax expenses and income tax adjustments, non-GAAP net income for the first quarter of 2013 was $312 million, up 9% compared to $287 million for the first quarter of 2012. GAAP diluted EPS was $0.09 in the first quarter of 2013. Excluding share-based compensation and related payroll tax expenses and income tax adjustments, non-GAAP diluted EPS for the first quarter of 2013 was $0.12, essentially flat compared to the first quarter of 2012. Capital expenditures — Capital expenditures for the quarter were $327 million, a 28% decrease from the first quarter of 2012. Additionally, $11 million of equipment was procured or financed through capital leases during the first quarter of 2013. Cash and marketable securities — Cash and marketable securities were $9.5 billion at the end of the first quarter of 2013. Alle Zahlen können unter Investor Relations auf Facebook detailliert betrachtet werden.